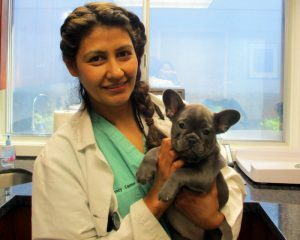 Dr. Simpson received her Doctorate of Veterinary Medicine from Ross University in June of 2000 after completion of her clinical year at the University of Missouri at Columbia. She and Dr. Dewey were only 1 year apart while they were in the West Indies at school together, so it must be fate along with the great wisdom to live in the most beautiful places on Earth which brought them back together again here on Maui. Dr. Simpson joined the At Home O’hana in January of 2017 with her husband Duncan and their wonderful daughters Ava and Emma along with a veritable Ark of furry family members in tow. Dr. Simpson has been practicing Emergency Medicine in El Paso, Texas for the past 10 years where she honed her surgical and diagnostic skills and where she developed into the unflappable, caring and compassionate doctor we are so fortunate to have with us today. She is very much looking forward to helping each of you make the most of the bond you share with your furry family members.